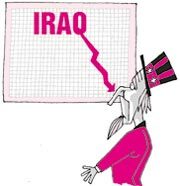 The fear of worsening economic crisis has the Americans agonising over the costs of a long-drawn engagement in Iraq. There is increasing pessimism about the us's "mission" in Iraq, says a recent Newsweek poll. Almost half of those who polled (47 per cent) were very concerned that maintenance of troops in Iraq will result in a massive budget deficit, lending a huge blow to an already struggling us economy. The current us spending of us $1 billion per week on Iraq is too much, said 60 per cent. Sixty-nine per cent were concerned (40 per cent very concerned; 29 per cent somewhat concerned) that the us may remain mired in Iraq for long without actually achieving its goals. Only a meager 18 per cent were confident that their country would, over time, succeed in installing a stable, democratic government in Iraq. These results must come as a warning to president George Bush, whose own approval ratings have slid to 53 per cent (18 per cent lower than April). The administration could well afford to ignore the countless civilians casualties in Iraq, but can it overlook what its own citizens, the electorate, have to say, and fear?